Nihonji Temple is one of the oldest temple in Kanto located in Chiba Boso Peninsula. It was established in 725 by Priest Gyoki. Nihonji is also known as Mt. Nokogiri that is one of the most popular spot in Kanto. Nihonji is also very famous for its Ajisai, Hydrangea. About 20,000 Ajisai trees are planted in this temple. From the middle of June to early July, they bloom beautiful flowers. There are many buddhist statue including Daibutsu and Rakan. Daibutsu is 31m tall. From the top of Mt. Nokogiri it has a great view of Boso Peninsula and Tokyo Bay. Admission fee: 600 yen for adult, and 400 yen kids. There is free parking at the bottom of temple. You can use the ropeway to visit the top of the mountain, but the great Buddha is located in the lower part of the mountain. Using the ropeway, exit on Hanakanaya Station. 4. use also the ferry from Kurihama, Yokosuka is convenient. Nihonji Temple is one of the oldest temple in Kanto Region. It is located western Boso Peninsula. About 1,300 years ago, Emperor Shomu and Empress Komyo ordered the imperial decree to priest Gyoki in and he established Nihonji Temple in 725. 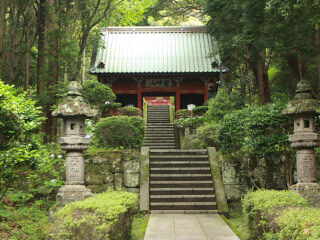 During Edo period, it became the temple of Soto Zen Buddhism. Nihonji has been highly respected. Therefore, it has the name of Japan. Nihonji means the temple of Japan. Legend said, the statues of Nioh were made by priest Gyoki. The name of Nihonji Daibutsu is Yakushirurikonyorai, and represent the entire the space is the pure land, and it leads the world to the peace and safe. It has 31m high and as the sitting great Buddha statue, Hinonji Daibutsu is the biggest Daibutsu in Japan. Original statue was built in 1783. However, around the end of Edo period, the damage by weathering, it lost almost the all shape until 1966. In 1969, it has been fixed. In 1779, craft man Kangoro Ono and his students spend 21 years to make 1,500 stone statues of Buddha and place the cliff of the mountain. As the Rakan spiritual sanctuary, it is the biggest in the world. Please keep in mind the manners when you visit Nihonji. - Don’t touch the stone statue and other facilities. - Don’t take the flowers of the mountain. - Take your trash with you and never leave it in the temple. - Smoke only at the smoking area and don’t trash the ash in the temple.